January 7, 2014 | Lens cap....off! I have an orchid. This is the first one I’ve ever owned, and I like to think that I rescued it (as happens for most of the plants in my house–my husband is very indulging). If memory serves, I picked it up at the 9th Circle of Hell (Wal-Mart) on clearance when it had a few flowers in bloom. My first intention in all plant purchases is First Do No Harm. I’m getting better in recent years, but I’ve been known to barely keep a philodendron alive…and I’ve heard those are ridiculously easy to care for. 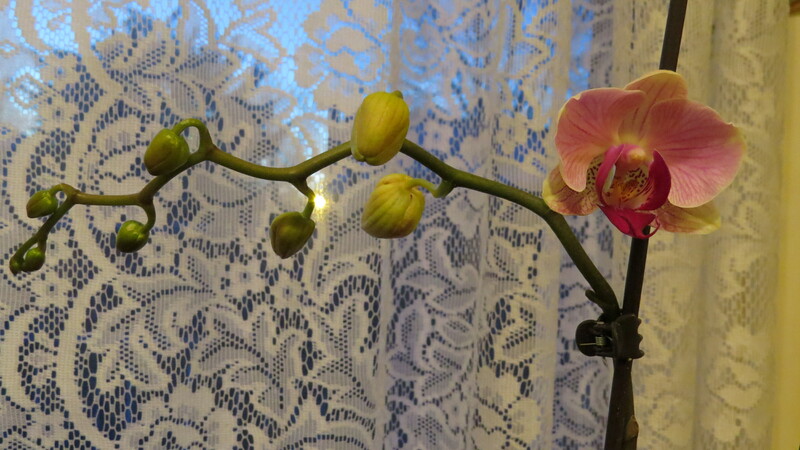 At any rate, the orchid displayed it’s lovely blooms for a time and then…nothing. I set out to keep it alive, and a month or so ago I realized that I needed to re-pot it. Not knowing what was entailed (orchids are a special bunch), I set off for YouTube. A video or two later, I got started. 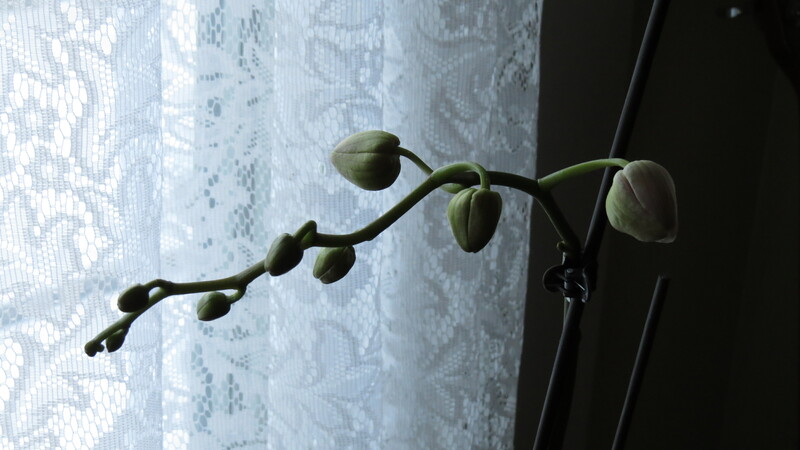 I was extremely surprised to find that while I had essentially left the orchid to itself (beyond the weekly watering) it had sprouted another stem–and it had buds on it. I was ecstatic! When would it bloom? What colors would the flowers be? Any chance I could schedule an appointment to see it happen? This morning I took a picture of my orchid. Something about it caught my attention; the lighting was low and it looked silhouetted and lovely. I was really pleased with the shot. The ISO was set to 500. I moved it to and fro, trying to replicate the lighting I saw and this seemed to work best. I was happy that I didn’t wait until the last minute to get a picture in for my project (Yay! Proactive!). Fast forward to Home From Work. I was thrilled to see that my orchid had bloomed. If I’m lucky I’ll see 9 more blooms. And I’ll be waiting to take a picture of each of them.